Do you guys know Jackie Sobon? She runs one of my favorite blogs, Vegan Yack Attack, and is an amazing photographer. 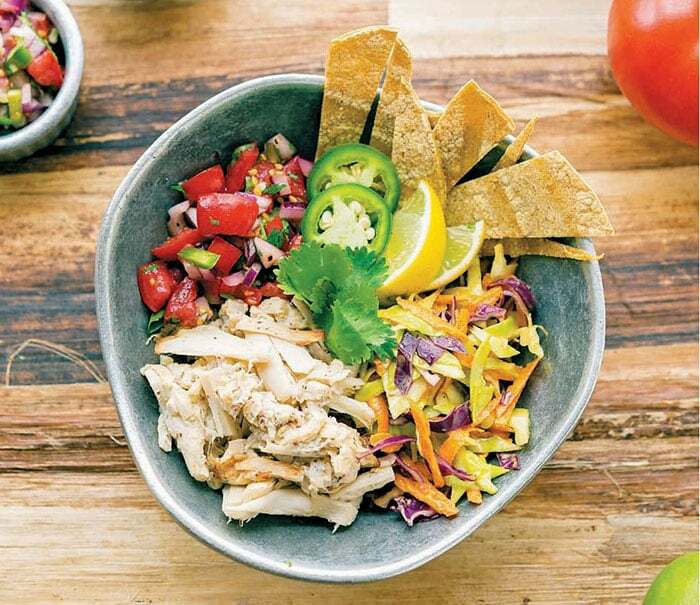 Vegan Bowl Attack is her very first book and I’m so glad I get to share her recipe for Hearts of Palm Vegan “Fish” Taco Bowl with you today. She uses hearts of palm to replace the seafood, and I love the texture. 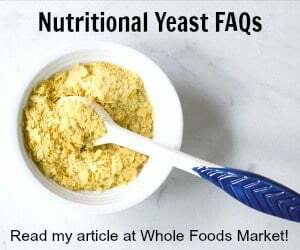 You can also get it in a regular grocery store making it easier to get your hands on than jackfruit for some of you. It’s a perfect recipe for a hot summer meal! 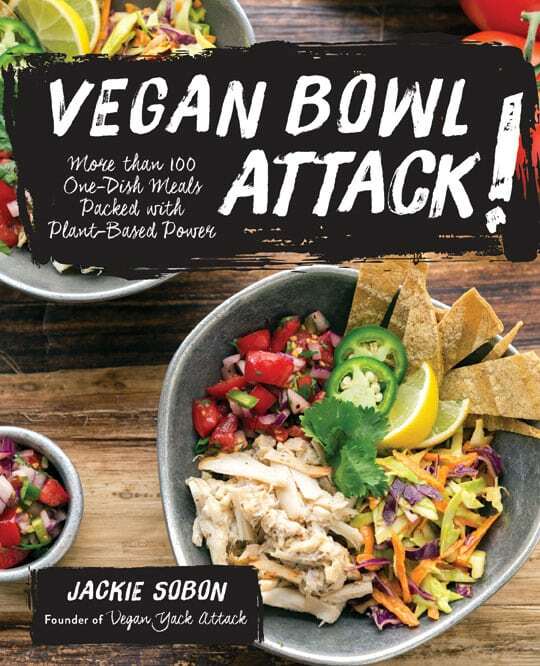 In the first chapter, Attack of the Vegan Bowls, Jackie gives you some helpful tip and formulas to get you making your own bowls from scratch. But don’t worry she gives you plenty of recipes to follow along with too. The breakfast chapter includes recipes for chai waffle stick dippers, biscuit nacho bowl, and melon madness bowl. The other chapter include snacks, soups, salads, entrees, and desserts too. There’s also a bowl essential chapter that gives recipes for sauces, seitan and more. So you’ll find a recipe for just about any kind of delicious morsel that you’re craving. Now I want to know what’s your go to bowl meal? Let me know in the comments. To make the cabbage slaw:Place all of the ingredients in a bowl, stir together until combined, and then refrigerate for 20 minutes. and then refrigerate for 20 minutes. To make the “fish”:Preheat the oven to 350°F (176°C, or gas mark 4) and coat a baking sheet with a thin layer of oil or nonstick cooking spray. In a mixing bowl, using two forks or your hands, pull apart the hearts of palm until they appear shredded. Stir in the lime juice, dulse flakes, and salt until combined and then spread the mixture out on the baking sheet in a single layer. Bake for 12 to 15 minutes until the edges start to turn golden brown. To assemble:While the “fish” is baking, place the tortilla strips on a baking sheet, brush with a thin layer of oil, and sprinkle with salt. Bake for 10 to 12 minutes until crispy. 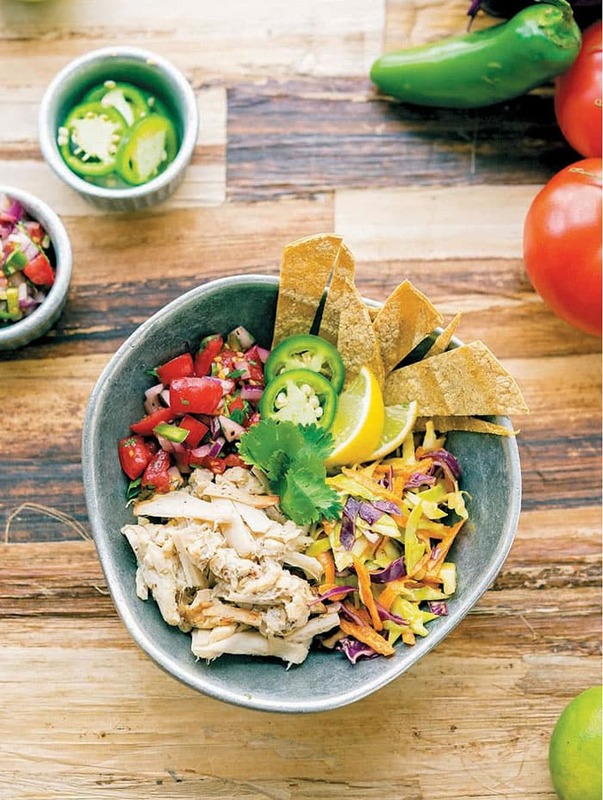 Divide the slaw, pico de gallo, “fish,” and tortillas among 4 shallow bowls, arranging the components in quadrants. Nestle the cilantro, jalapeño, and lime wedges in with the tortilla strips. Serve immediately. This sounds tasty. There are lots of great sounding recipes in this book that I’ve seen previewed online. I actually won a copy a year ago, but I never received it. It’s too bad because it sounds like I would have loved it. I’m so sorry to hear that. You might email Jackie Sobon and ask her to pass your address on to her publisher’s PR person. My boyfriend and I made this Tonight as tacos (instead of bowls )with flour tortillas. The taste of the heart of palm was so fishy and delicious. Yummily hit the mark! We also loved the slaw. I will be making this again some time soon. Easy to make. The recipe was beautifully clear in instructions. The taste was perfection! !